Malaysia Property News | Property Market In Malaysia: Whither retail space? Night view of the beautiful and unique Sunway Giza. PROPERTY developers might have a problem filling their up-and-coming malls with prospective tenants given the shaky global economy and cautious consumer sentiment currently. This situation is compounded by the fact that Malaysia has an oversupply of retail space. “Retail supply is growing despite the economic slowdown. Developers in all parts of Malaysia are still planning and building shopping centres,” says Henry Butcher Retail managing director Tan Hai Hsin. 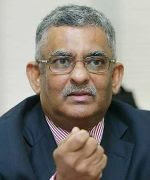 According to him, total retail space for Klang Valley in 2010 is at 49 million sq ft. For this year, it is expected to increase by 3.5 million sq feet, with an expected 50 to 60 new shopping centres expected to be built in Malaysia. “In general, there is an oversupply of retail space throughout the country,” he says, adding that the greatest challenge for shopping centres today is not about themes or concepts, but rather, market saturation. Tan says that many shopping centres are also finding it difficult to get the right anchor tenants. “Yet at the same time, many developers are still planning for shopping centres throughout the country,” he says. According to the National Property Information Centre's (Napic) property market report 2010, the retail market continued to record substantial amount of take-up at 268,027 sq m (2009: 269,504 sq m). With the exception of Kedah (-11,545 sq m) and Pahang (-11,349 sq m), all other states registered positive take-up. 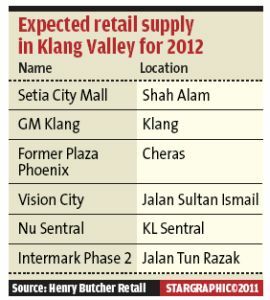 Kedah and Pahang registered negative take-up as both had anchor tenant exit from one of their shopping complexes. Malacca had the highest take-up space of 92,880 sq m. Selangor and Johor trailed with 48,916 sq m and 34,977 sq m respectively. The national occupancy rate reduced marginally to 80.2% compared with 81.5% achieved in the previous year. This was partially due to the lower occupancy rate attained by the new completions at 38.0% (2009: 55.9%). Eight states achieved occupancy rates above the national average including Kuala Lumpur and Selangor. As at year-end 2010, the country had nearly 2.09 million sq m of space available for occupation. Construction activity continued to soften as depicted by lower construction starts at -2.3% against 2009. There were 28 buildings from 11 states commencing construction with a combined retail space of 420,255 sq m. New building plan approvals decreased by 57.6% from 2009. However, 2010 witnessed more completions against 2009. The completions were recorded in 13 states including Putrajaya. A total of 501,106 sq m of new retail space came on-stream, bringing up the country's total existing space to 10.59 million sq m.
Among the major completions were Malacca's Aeon Jaya Jusco, Econsave Hypermarket and Tesco Extra which offered a combined space of 74,152 sq m. Sabah saw the entrance of Suria Sabah in Kota Kinabalu, Mega Long in Penampang and Keningau Mall with a combined 72,516 sq m of retail space. In Penang are 1st Avenue and Straits Quay Mall with a combined space of 126,026 sq m.
The future supply was ample with 94 complexes (1.73 million sq m) incoming and 65 complexes (1.65 million sq m) in the pipeline. Fernandez does not expect prices to shoot up any time soon. Khong & Jaafar Sdn Bhd managing director Elvin Fernandez says that despite the oversupply of retail space in Malaysia, average prime, ground floor rental rates of downtown shopping centres (namely Suria KLCC and Pavilion in Kuala Lumpur) and suburban shopping centres (Mid Valley in Kuala Lumpur, 1Utama and Sunway Pyramid in Selangor) have been holding steady. He noted that even during the global economic crisis, rates remained fairly steady. Fernandez says he does not expect prices to shoot up any time soon given the volatility of the global economy. Stable consumer spending and good tourism levels have managed to help keep retail rates stable, he says. Fernandez says that with the “summer” period over, the influx of tourists into Malaysia will decline in the coming months. An analyst says the economic crises currently looming over the United States and Europe could affect tourist arrivals from that region. “Their spending power will be curbed. For those who do have the money to travel, they may hold back on their long-distance travels,” he says. Tan points out that the current world debt crisis is worrying and that it is affecting the Malaysian economy. Credit Suisse AG recently cut its real gross domestic product (GDP) 2011 growth forecast for Malaysia to 4.6% from 5.3%, in light of the West teetering on the brink of recession, especially with large parts of Asia remaining highly susceptible to growth developments in the United States and Europe. Tan says consumer spending has also been curbed due to price inflation. “Many things, from basic necessities to eating in restaurants, are more expensive than last year. But most of us are still earning the same salaries. We are paying more for the same things. Thus, we are buying fewer things than last year. 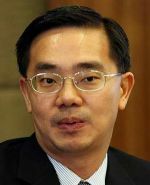 With the oversupply problem and cautious consumer sentiment, Tan says older malls would need to “refresh” themselves in order to compete better. Tan says the local retail sector is still slated for positive growth this year. 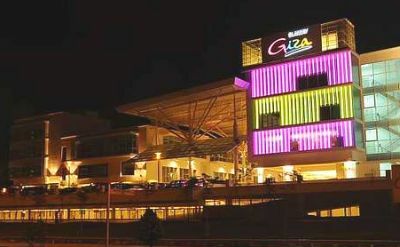 “For the first quarter of 2011, the Malaysian retail industry recorded a moderate growth rate of 5.1% in sales compared with the same period in 2010. For the second quarter of this year, we are estimating retail industry to grow by 7%. “For the whole year, we are projecting a growth rate of 6% or a sale value of RM81.6bil,” he says.